I try to organized…I really do. It was so easy for me when I was working in the corporate world but as a homeschooling mom of three young children, I find it increasingly difficult to manage an organized household. 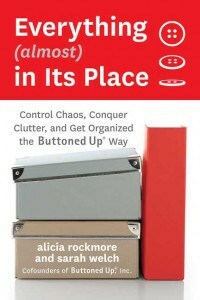 I have read A LOT of books about being organized but I was very pleased to read Everything (almost) In Its Place by Alicia Rockmore and Sarah Welch. I really like that the authors’ approach is adaptable to any household. I don’t have to put an elaborate, time consuming color coordinated closet together in order to “be organized.” Instead this book offers lots of smart, real world tips and ideas about organizing your home. My favorites include “Stop Chasing Someone Else’s Ideas About Perfection” and the section about controlling mail which is one of my biggest challenges. Alicia Rockmore and Sarah Welch are the co-founders of Buttoned Up, Inc which was created to help busy women “tame the chaos” in our lives. I am excited to get my chaos under control and if you find yourself in need of a bit of help to get organized, I highly recommend Everything (almost) In Its Place. Book Review | Tuck Me In!